Surgical sponges left inside patients by negligent surgical teams continues to be the most common complication in the OR. Manual count before and after the procedure is the standard practice, however its is prone to error. Some surgical sponges left inside patients might never be known if patients don’t return to the surgeon with a complaint of discomfort or pain. Ventilators that are not proprely set up or defective continue to cause hypoxic brain injury or death. Ventilators, if proprely set with a functioning alarm are reliable life support devices. However too often they are not proprely set or not proprely manufactured which can as a result prevent adequate ventilation to the patient. When such problem occurs, an alarm is supposed to ring so that the issue can be addressed immediately. However too often the alarm is not proprely set up and as a consequence many patients suffer hypoxic brain injury or die because of defective ventilators. Infected flexible endoscopes continue to be a major challenge for hospitals and other healthcare facilities. Not only the staff in charge of cleaning the endoscopes have to follow a precise protocol to clean the devices but another very important step in the cleaning process is drying. An instrument that is stored without being proprely dried and that still contains viable microbes can infect the entire storage area as microbes quickly proliferate and colonize the space. Re-contamination can also occur when negligent employees touch the instrument with contaminated gloves or during transport. Errors of dosage with infusion pumps. 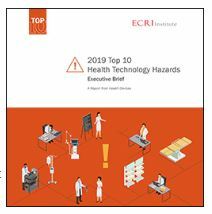 The ECRI Institute received many reports from clinicians mentioning staff entering the intended flow rate in the dose rate field of infusion pumps. According to them this type of error is very common but not often reported. However it can lead to dangerous medication administration errors that can seriously harm patients. Improperly customizing alarms on a physiologic monitoring system can result in serious injury or death of a patient. Physiological monitoring system have so many different type of alarms that it can be challenging for the medical staff to find the proper balance between activating too many or not enough alarms. Proper training is key to limit this type of risk. Defective or not proprely installed overhead patient lift system can result in serious harm. Lift system can be of great help for nurses or medical aids who need to transfer a patient from a bed to a wheelchair for example. However if the system is not proprely installed, tested and maintained it can result in terrible injuries not only to the patient but also to nearby relatives or medical staff. Improper cleaning of electrical devices resulting in fire, damage or malfunction. To prevent infection it is essential that all devices be proprely disinfected. However it is as important that the staff cleaning electrical devices be proprely trained to execute this task and follow manufacturers instructions for each specific device. Too often using disinfectant wipes that have excess fluid or spraying directly onto a device results in liquid dripping into the electrical components of the devices. This may cause damage or even fires. Batteries that are not sufficiently charged can have dramatic consequences when they are used for medical devices. Its is the staff responsibility to make sure that batteries are proprely charged and maintained. Sometimes battery chargers or the battery itself can also be defective. The ECRI Institute mentions a case related to the death of a patient whose ventilator stopped functioning because the battery died while the battery status gauge was incorrectly indicating that the battery was charged.